Mix together the ground beef, minced onions, ketchup, chili powder, shredded cheese, and the salt and pepper. 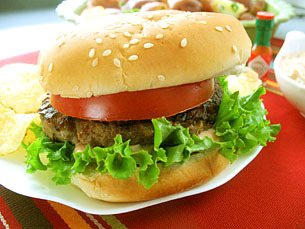 In a non-stick, pre-heated frying pan, set to medium high heat, fry the burgers for 4 minutes on each side. Serve on a toasted roll with Tex-Mex Burger sauce. I would still add a slice of processed cheese on top while the patties are in the last couple minutes of frying. I know that they already have cheese inside, but, … decadence, decadence, decadence. This recipe has become a family favorite. I’m going to have to give that extra slice of cheese on the top a try, it does sound delicious! (If your social life permits), a big slice of purple onion is fantastic on these burgers! WOW! Believe it or not I found out this site while I was searching videopodcast to learn a little bit of english. And I find it gorgeous! Thank you for creating such helpful cooking videos. I am re-learning a lot and our Tex-Mex Burgers tasted great! I am getting a lot of use out of my video-i-pod! That’s wonderful Melanie! My dream of making all this happen is actually coming true! I am perplexed about how to cook a hamburger and avoid the fat. My toaster oven was what I used as it had a timer and temperature control, but is way to hard to clean the fat splatter after broiling a few burgers. If I fry the stove top the fat splatters so I use a lid – the problem is the burnger sits in the fat and there is no timer with auto turn off, and I sometimes do not hear the timer go off when elsewhere in the house. Those George Forman or similar grills have no timer nor temperature control, and no on/off button so sparks show when the plug is plugged in. What i think I want is an easy to clean toaster oven ! What can I do? I think your best bet is a stove-top grill pan with a splatter guard, which have to be purchased separately. I used a stove-top grill pan in my Grilled Chicken video. Splatter guards are a mesh screen that you put over the pan as food is frying. It helps to control the splatter. Add some variations to your burger recipes with these fantastic and delicious tex-mex cheeseburgers! Anyone can cook tasty burgers by following those simple and easy steps to making tex-mex cheeseburgers.